that in case he is unavailable. cases (the feature is almost three years old now since lbivirt 1.3.3). We met an issue when run virt-manager on huawei arm server with 18.04.1.
core_id as high as 6216.
alter its size at runtime to accomodate such values. I made a patch for it, after test, this issue is fixed. virt-manager could be run successfully. The attachment "libvirt-utils-remove-arbitrary-limit.patch" seems to be a patch. If it isn't, please remove the "patch" flag from the attachment, remove the "patch" tag, and if you are a member of the ~ubuntu-reviewers, unsubscribe the team. thank you a lot for your report and identifying + verifying the test. OTOH I think the limit is in place long enough to not touch and have the backport noise to Xenial. Therefor I'll define Bionic and Cosmic as affected, but for the SRU  I'll need the fix in the latest release first. I'm working on libvirt 4.10 anyway atm, so that is already ongoing. But I'm on a business trip next week so things will take a while. After the newer libvirt completes I'll take a look at also creating an SRU for it then. Even thou that will take a short while, since this needs special HW to test I wanted to ask you if you will then be willing and able to do the SRU verification on Bionic and Cosmic as you have the right HW to do so. For now there is not much more to do than to wait until the new libvirt completes, if anything you might help by copying the SRU template from  and editing it into the bug description here. This would be nice, but if you won't I can do it when I prepare the SRU. Fine, it's okay for bionic and cosmic, and when you are ready, just let me know it, I would like help. Thanks a lot! - Autostart default bridged network (As upstream does, but not Debian). + do not autostart if subnet is already taken (e.g. in guests). due to the group access change. - ubuntu/parallel-shutdown.patch: set parallel shutdown by default. included_files to avoid build failures due to duplicate definitions. + systemtap, zfs, numa and numad on s390x. or is part of a continuous upstreaming effort. I'm prepping this for the stable release updates and wanted to check with you if you will be willing and able to verify the fix on your hardware? That would be two times - once with a PPA I will provide soon and once more with a package from Bionic/Cosmic-proposed when the actual SRU takes place. Let me know if you have the necessary HW to verify this as it would help to raise the confidence for the SRU team  to accept the change. In addition I'll push these PPAs through the automated regression tests for qemu/libvirt. Now I am in Chinese Spring Festival holiday, will back on 15th Feb. Thanks. > Cosmic  and Bionic . > to verify the fix. > that in case he is unavailable. > cases (the feature is almost three years old now since lbivirt 1.3.3). Ping, any chance to pre-check - I really want to get this going. Sorry for late, I had tried the 3621 for bionic, after installed new below packages, it works fine. And I couldn't test he cosmic one, because we had only one hardware and we just need to support it for bionic. I thought it should be okay for the cosmic packages if the patches were same with bionic. @Bin - For the final verification in -proposed- which will be called by the SRU team I'd really appreciate if you then could also give Cosmic a test (Even if you / your project only needs it for Bionic). That said -all prechecks ready and uploaded to the SRU queue waiting for approval. Accepted libvirt into cosmic-proposed. The package will build now and be available at https://launchpad.net/ubuntu/+source/libvirt/4.6.0-2ubuntu3.3 in a few hours, and then in the -proposed repository. Accepted libvirt into bionic-proposed. The package will build now and be available at https://launchpad.net/ubuntu/+source/libvirt/4.0.0-1ubuntu8.7 in a few hours, and then in the -proposed repository. Enabled the proposed on bionic, and did update, it work fine now. Thanks! @Bin - thanks for the quick test. I know you personally only need it for Bionic - but for this to complete overall we also would need a verification on Cosmic. Any chance you can upgrade one of your devices to give it a test as well? Okay, I will try, and I just prepare verify it on amd64 first for cosmic, so that I could make sure the libvirt work correctly. Thanks! First I tried cosmic amd64 on Thinkpad T480s, upgraded libvirt0 to 4.6.0-2ubuntu3.3. It could run virt-manager successfully. 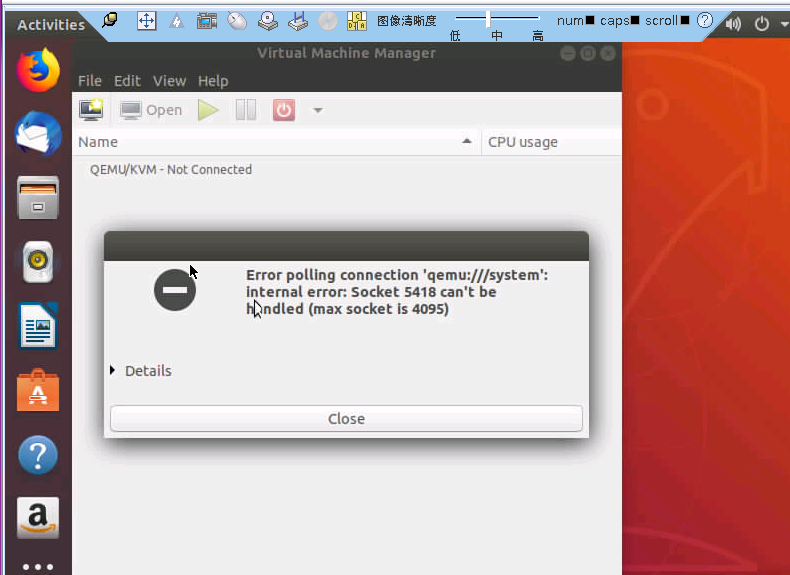 I installed the cosmic on Huawei arm server, I could reproduce with libvirt0 4.6.0-2ubuntu3.2, after enabled the proposed, upgraded to 4.6.0-2ubuntu3.3, then it works fine. Thanks! The verification of the Stable Release Update for libvirt has completed successfully and the package has now been released to -updates. Subsequently, the Ubuntu Stable Release Updates Team is being unsubscribed and will not receive messages about this bug report. In the event that you encounter a regression using the package from -updates please report a new bug using ubuntu-bug and tag the bug report regression-update so we can easily find any regressions.